The purple, pear-shaped fruit displayed in the produce section of the grocery store only tells a small part of the eggplant’s story. Native to Asia, where it’s still found growing wild as a perennial, eggplant has been used for thousands of years. 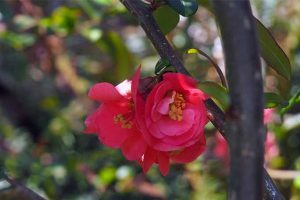 And while mostly enjoyed for its edible fruit, it also has a history of medicinal use. 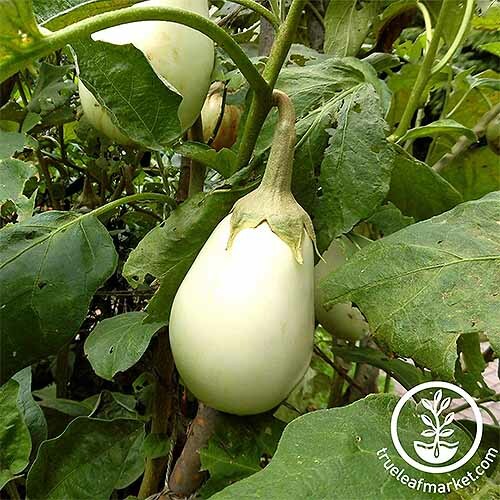 Vegetative parts and roots from wild eggplant species, including Solanum americanum and S. insanum, have been documented as a sedative and in the treatment of skin issues, such as rashes and sores. Crushed seeds from multiple species were once used to treat toothaches. 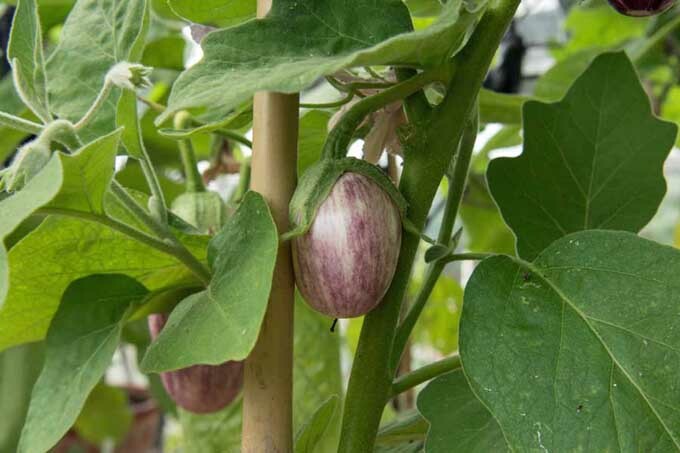 And the fruit of the common eggplant we know today, S. melongena, is said to have a number of potential health benefits, like alleviating liver issues. 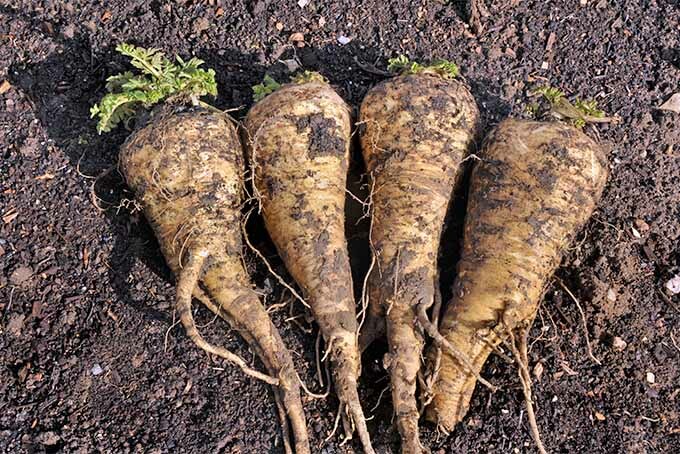 Given its rich history, it’s no surprise that this warm-season crop has become a mainstay in the kitchen. Fried, sautéed, baked, breaded, stuffed, or roasted, this versatile edible can easily serve as the main dish or stand alone as a side. 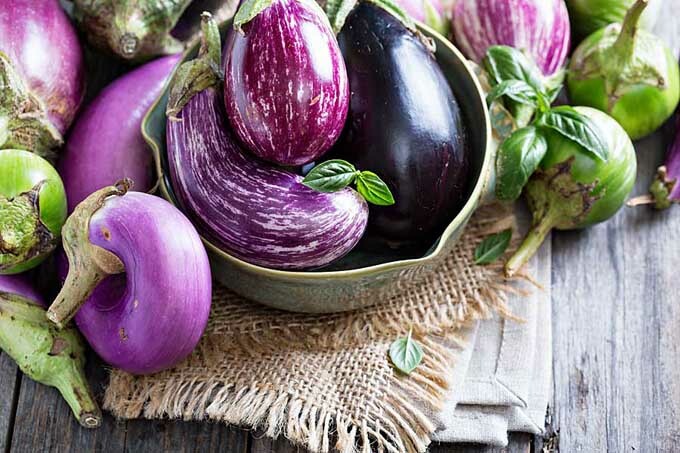 With so many varieties to choose from and a number of ways to include them in a meal, eggplant makes a great addition to any summer vegetable garden. 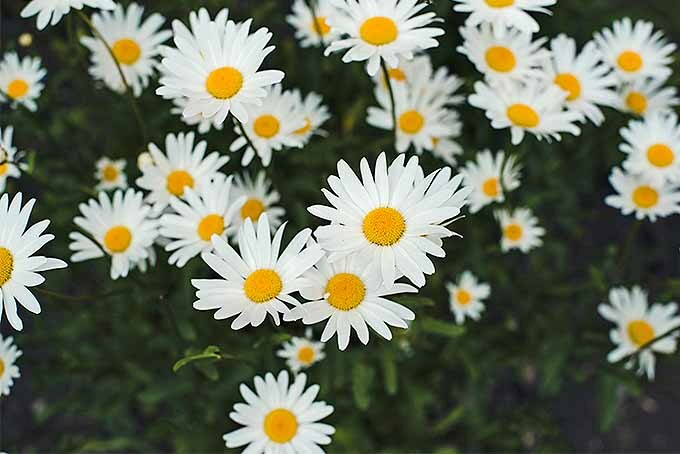 Keep reading to learn how to grow this summer-loving beauty for yourself. 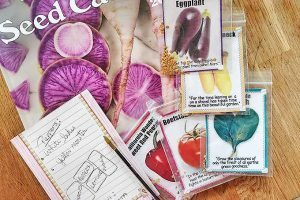 If you’re hoping to grow eggplant from seed, you’ll want to start them indoors 8 to 10 weeks before the average last frost date in spring for your area. Seed to harvest usually takes between 100 and 120 days, so timing is key. Sow seeds in moistened seed starting mix, just 1/4 inch deep, and keep soil moist. Germination can take a while to occur if the soil temperature is below 80°F, so your best bet is to invest in a heating mat. It will also help to cover seed trays or containers with plastic wrap to retain heat and moisture. If the soil is warm enough, germination should occur within ten days. 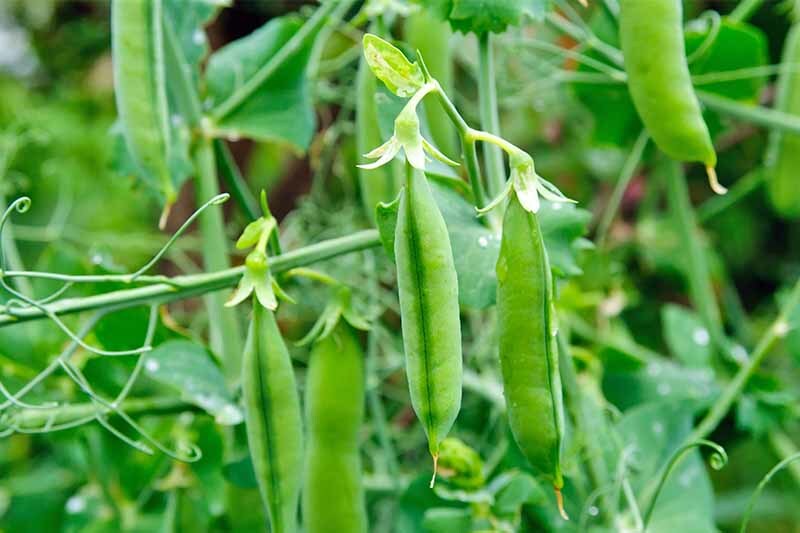 Seeds will germinate as long as the soil is at least 60°F, but you’ll be waiting for a while. Once they’ve emerged, place seedlings in the sunniest spot possible. When plants have a couple of true leaves, repot them in a larger container using potting mix and an appropriate organic fertilizer. 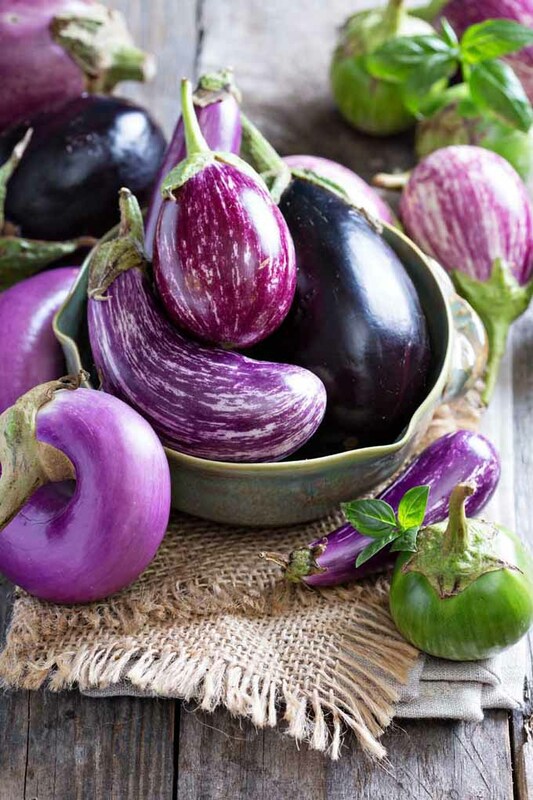 In the Solanaceae family, right along with peppers and tomatoes, it’s no surprise that eggplants prefer hot weather. But, they like it even hotter than their popular cousins. Anything below 50°F and plants will noticeably suffer, and a bout of frost will take them out altogether. 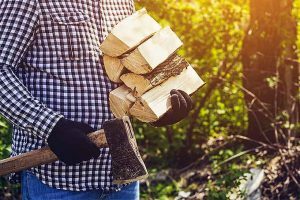 For this reason, you’ll want to wait until temperatures are consistently warm, around 70°F, to move them outdoors. Soil temperature should be a minimum of 60°F before transplanting. 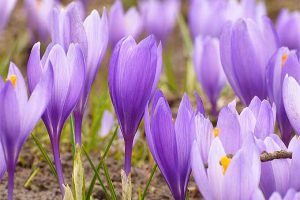 To be on the safe side, wait two to three weeks after the last frost in spring to set plants out in the garden. Raised beds are a great option because the soil warms up faster. In the beginning of the season, you can also lay black plastic over the soil to get the temperature up. Eggplants grow well in containers, too. 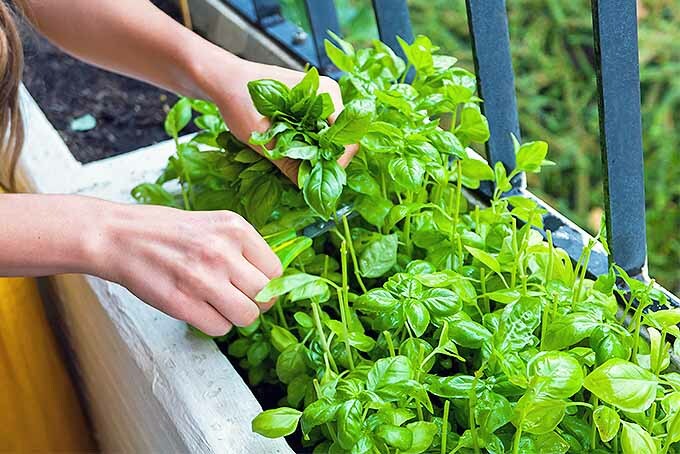 Use a 5-gallon container for each plant and fill with moistened organic potting mix. You’ll want to use a slow-release, balanced fertilizer at the time of planting and supplement throughout the season. 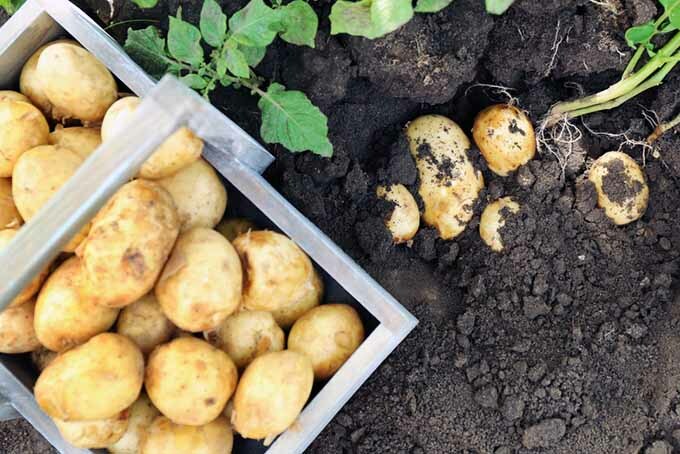 Granular fertilizer is a good option for container plantings since, in my experience, compost typically results in waterlogged soil over time. Plain, unamended potting soil doesn’t offer any nutrient value to the plants. Also keep in mind that containers dry out faster, so you will need to water frequently. Harden off transplants for a few days, even those bought from the nursery, by slowly getting them used to the outdoors. 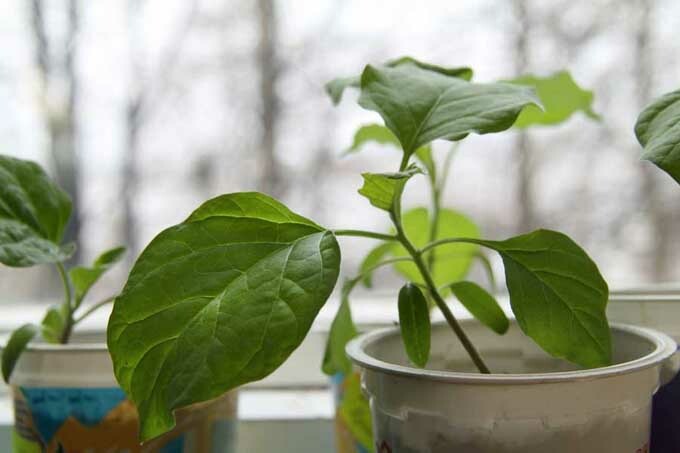 Plants typically grow to be at least 18 inches both wide and tall, so space appropriately to allow for airflow. 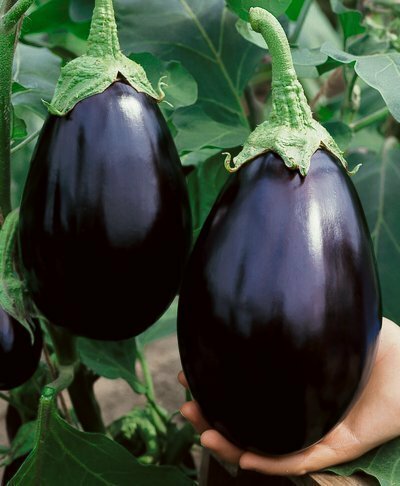 Eggplant thrives in full sun, more than 6 hours a day, and fertile, slightly acidic, well draining soil. Consider mixing a couple handfuls of compost into each hole as you transplant seedlings into the garden. The best way to ensure fertile soil is to send a sample to the pros for a fertility analysis. If you forego a soil test, keep an eye on your plants. If they are thriving, great! If they aren’t, and it’s hot and sunny just how they like it, it may be the soil. 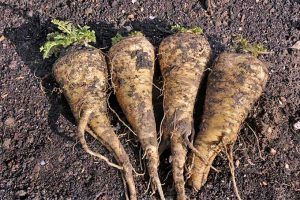 For the long term, encourage healthy soil by rotating crops, using cover crops, and adding several inches of fresh organic compost a couple times each year. 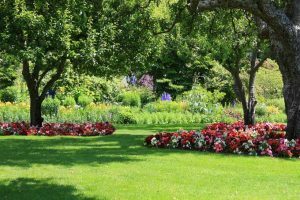 In the short term, consider applying 3 pounds of 5-10-10 fertilizer to every 100 square feet of planted area. 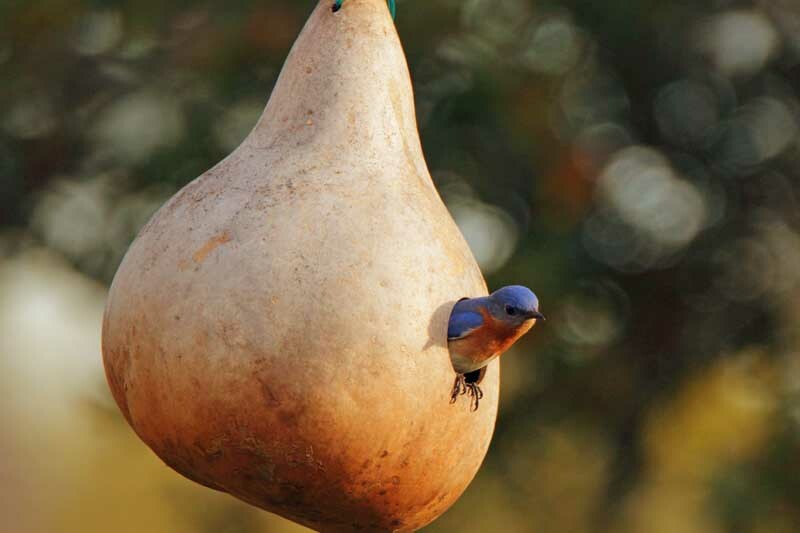 While eggplants are moderately heavy feeders, don’t overdo it on the nitrogen. If lush green leaves are out of control but there are very few flowers, too much nitrogen may be the issue. Cool weather is the nemesis of the eggplant grower. If temperatures are consistently at or below 60°F, there won’t be much of a harvest. 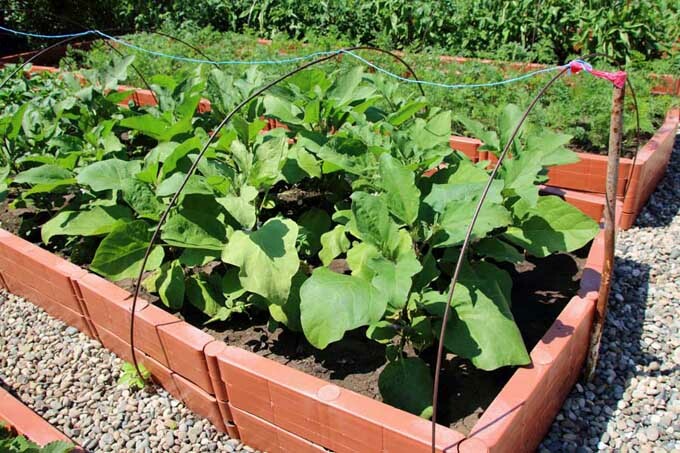 If you live in an area where cooler summers are common, try using a row cover or hoop house to trap heat. The sweet spot for fruit production is between 70 and 85°F. And even though eggplant is known to thrive in hot weather, if temperatures are steadily above 95°F, plants will stop setting fruit. Be mindful to water sufficiently, especially when fruits are developing. Water consistently, to a depth of 6 inches or more. 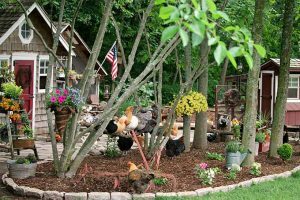 Use organic mulch as well, which will help to maintain moisture levels. 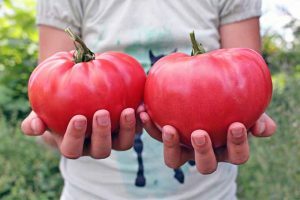 Fruits are heavy, so stake plants from the beginning in the same way you would stake a tomato. This will keep leaves off the ground, which will help to reduce chances for disease and keep fruits from becoming deformed. 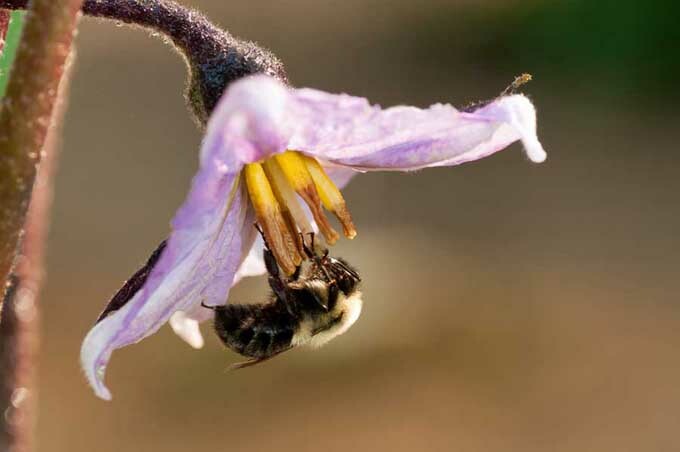 Eggplants, much like tomatoes and peppers, have flowers with both male and female parts and are considered self-pollinating. However, wind and pollinators can only help. 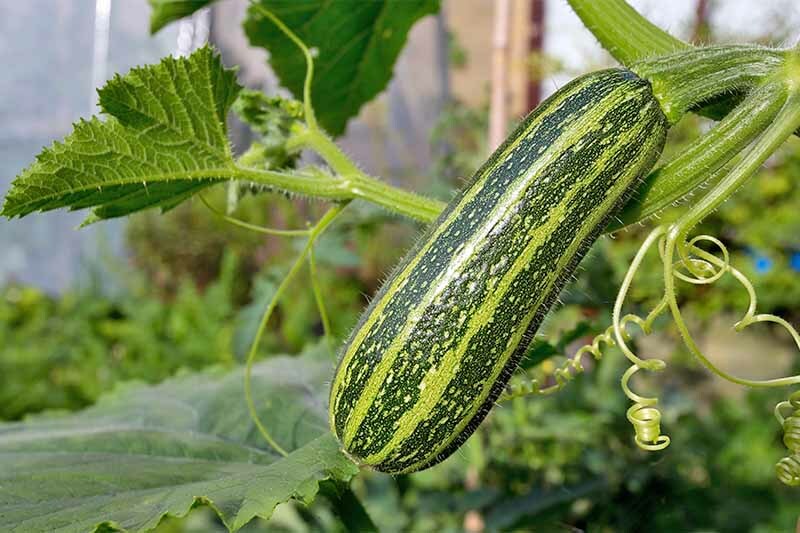 So, while hoop houses and row covers are great tools, you may have a smaller harvest if you keep crops enclosed throughout the entire growing season. With that said, give plants a little shake here and there to further improve chances for pollination. White, yellow, green, and varying shades of purple fruit come in a multitude of shapes and sizes, and are enjoyed all over the world. 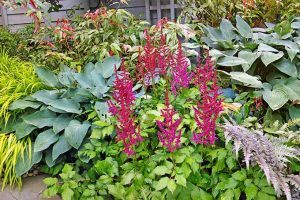 A good place to start might be the classic ‘Black Beauty’ — a 6-inch, dark purple type that is particularly suited to home gardens. You can get 0.5 grams, about 100 seeds, from Generic Seeds via Amazon. 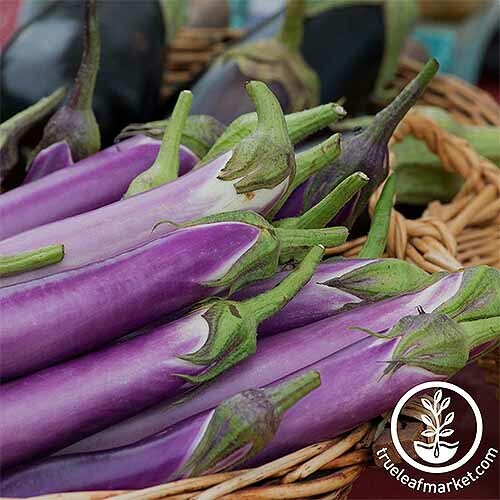 If long and skinny is more your style, you might like the ‘Millionaire Purple Hybrid’ eggplant, available from True Leaf Market. 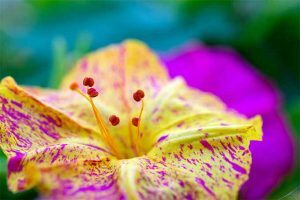 You’ll get 100 seeds that will develop into plants bearing 8-inch fruits, with light to dark purple skin. True Leaf also sells ‘Gretel,’ which produces white, 3- to 4-inch fruit that are sweet and tender-skinned. You’ll get 100 seeds for this 2009 All-American Selection winner. 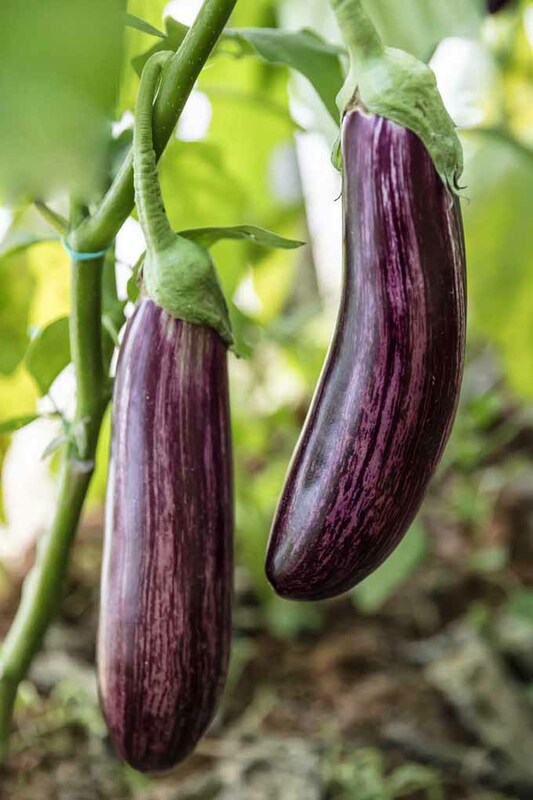 If you’d like to grow several types of eggplant, this combo pack from Burpee contains four eggplant varieties, and it’s available via Amazon or directly from Burpee.com. I’m always amazed at how pests can sniff out their targets. 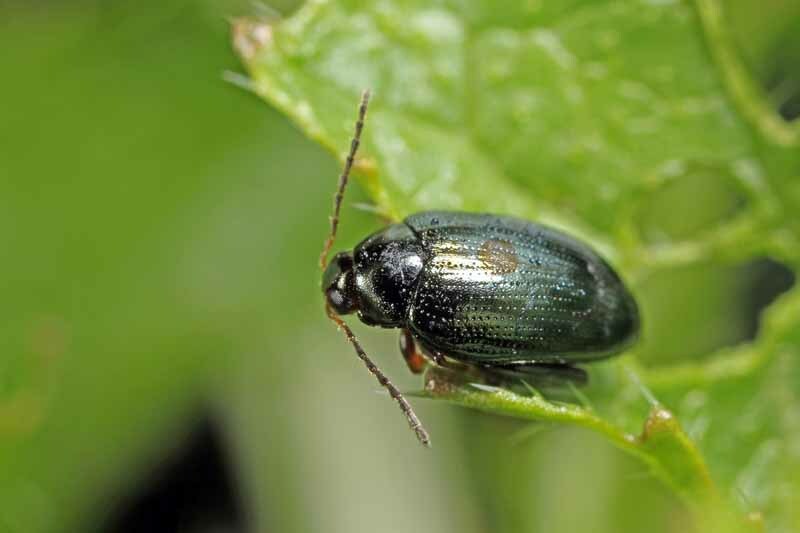 Flea beetles especially have a real talent for finding any and every eggplant ever grown. Okay – so that might be a little dramatic. But seriously, their tiny holes punctured in the leaves let you know they’ve found your stash. 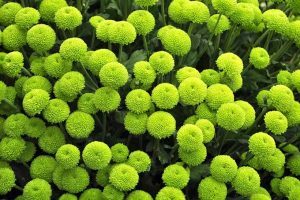 But with some perseverance, they can be controlled with organic methods or dealt with by chemical pesticide. Other pests that like to make a meal out of eggplant include cutworms and spider mites. Cutworms, which are moth larvae, do their damage at night, which is pretty obvious come morning. Spider mites can barely even be seen and hide on the undersides of leaves. If you turn over a leaf and see a white web-like residue, it’s likely spider mites. 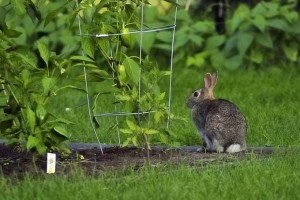 Fortunately, healthy plants can handle a few unwanted critters. Grow them under row covers until they’re large enough to withstand damage. If action must be taken, consider diatomaceous earth or insecticidal soaps. As for diseases, prevention is key. 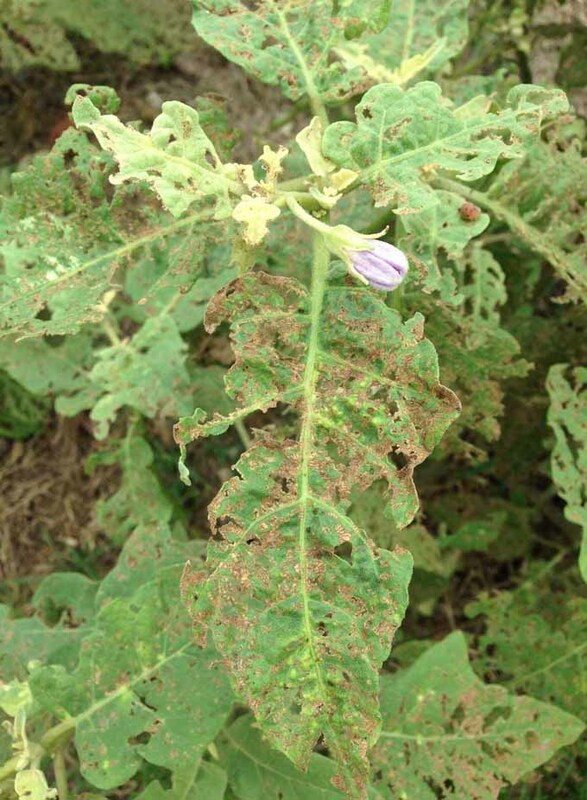 Powdery mildew and verticillium wilt have been known to affect eggplant and are difficult to control once present. Verticillium wilt in particular is caused by soil-borne fungi that can survive for more than ten years, even without a host present. Once infected, remove plants immediately. 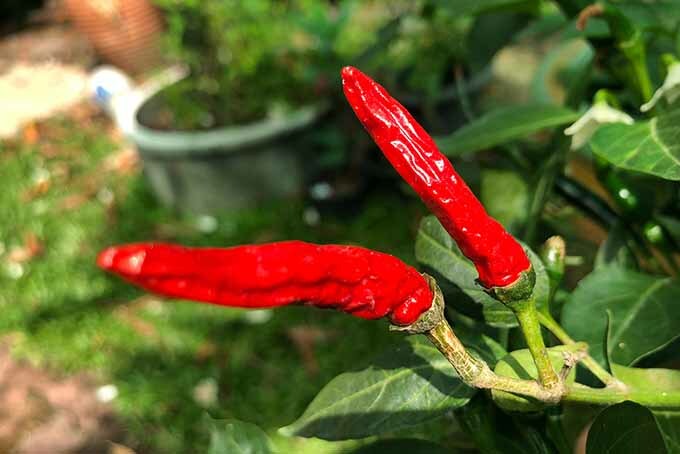 Avoid growing host plants, which include other members of the Solonaceae family like tomatoes and peppers, in the impacted area for at least three years. 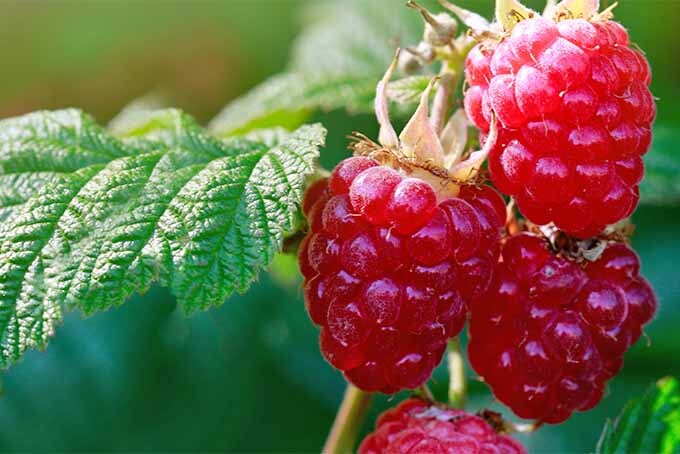 Rotating crops year to year, removing diseased vegetation, watering smart, and growing resistant varieties if available will all help to prevent pests and diseases. Although time consuming to start from seed, it’s beyond worth it. 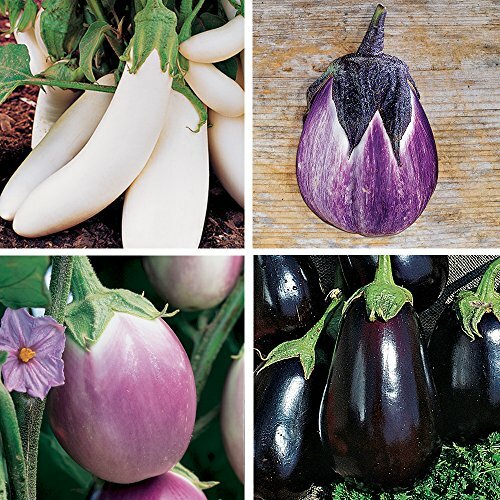 Eggplants come in so many varieties, and if you start them from seed you can try any type you want. Once in the ground, they tend to get along pretty well. 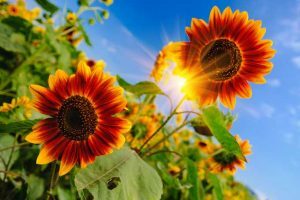 A hot, sunny spot with well draining soil is of course ideal, but you’ll likely have some success even if conditions are less than perfect. And the satisfaction of including homegrown eggplant at dinner will keep you perusing the seed catalogs year after year. 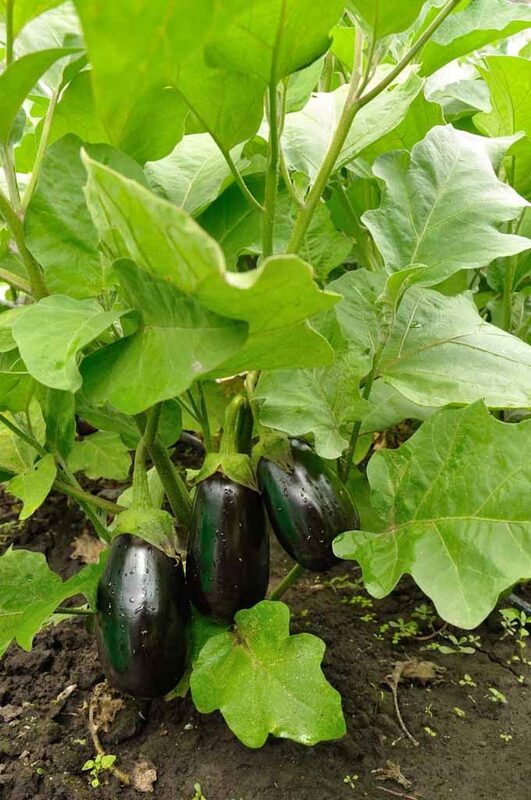 Have you grown eggplant before? What’s your secret to success? Let us know in the comments below. Product photos via Generic Seeds, True Leaf Market, and Burpee. Uncredited photos: Shutterstock. With additional writing by Gretchen Heber.